Another 65 wins & 42 nominations. I checked out a sneak preview of Ratatouille last night, and I must say I truly loved this movie. Everything from the animation to the score to the voice acting to the story (and especially the story) was EXCELLENT. I don't know if it appeals to kids as much as other Pixar offerings, but this one upholds their legacy of excellence. Casting Patton Oswalt as Remy was PERFECT. The rest of the voice cast was outstanding as well...including Pixar "house voice" John Ratzenberger. See if you can tell which guy he is without foreknowledge (as in, don't read the cast list). Michael Giacchino's score was as perfect for this story as the award-winning one he created for "The Incredibles" and the incredible music he has created for most of J.J. Abrams' recent projects, including "Alias" and "Lost". Even with my 3-year-old son making it really hard to concentrate, and our "we got to the theater late and had to sit up front" seats, this movie was fantastic. Everyone should go see it, even if they don't have kids. 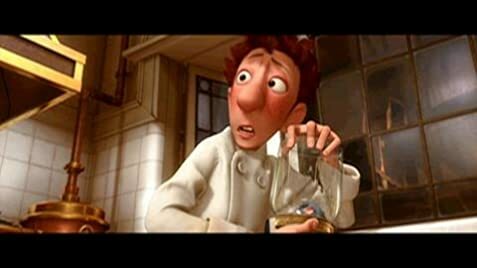 Brad Bird - you done right by us movie fans again...Ratatouille is great! The concept was first hatched by Jan Pinkava in 2001, and he had mapped out the original design, sets, characters, and core story. However, Pixar management was not convinced that the main story was delivering the goods, so Pinkava was replaced by Brad Bird in 2005. (at around 45 mins) Moments after Colette berates Alfredo for his messy sleeves, his sleeves are clean. Every single Pixar employee--including those who did not work on the film--is listed somewhere in the credits. Apart from language-dependent localization, the European versions are different from the American version: most of the movie's inscriptions are in French instead of English. For instance, in each shot it appears, the title of Gousteau's book is "Tout le monde peut cuisiner!" instead of "Everyone can cook!"